VICHY AQUALIA THERMAL SERUM Dynamic Hydration Power Serum 30ml, a powerful hydrating facial serum for dehydrated skin. An innovative formula with a lightweight and silky texture that works to deliver deep and lasting hydration. Enriched with Hyaluronic Acid the power serum soothes and restores comfort to dehydrated skin. Skin looks plumper, and the complexion looks fresh and radiant, dehydrated lines look smoothed. With VICHY Thermal Spa Water to cool irritation and relieve tightness. Active Ingredients: Hyaluronic Acid, VICHY Thermal Spa Water. Treatment Type: Hyaluronic Acid Facial Moisturiser. 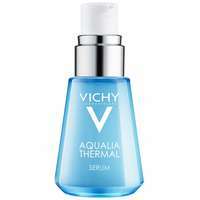 VICHY AQUALIA THERMAL SERUM Dynamic Hydration Power Serum 30ml was found on 4 websites and was price compared using EAN: 3337875588713. The cheapest VICHY AQUALIA THERMAL SERUM Dynamic Hydration Power Serum 30ml is shown as the main item, prices range from £16.90 to £23.15, excluding delivery. Price comparison based on price and delivery charges, with any valid discount codes being applied, is shown in the table above. Prices and information correct at the time of publication.